My flight from Athens was delayed so I missed my ferry. I not only arrived late, I also ended up on the other side of the island. Both Irene and Dimitri drove 45 minutes, held up a sign at the port, picked me up and drove me home for free. Their kindness made me feel so welcomed even before I arrived. Upon my arrival, the accommodation lived up to and surpassed my expectations. All the amenities walked perfectly and the view was impeccable. Do not be put off by the short walk from the city centre. Add to the charm of the place and the view you get makes it all worthwhile. I'm definitely going back soon! Thank you Irene and Dimitri for making my holiday special. Everything was perfect. The hosts were extremely kind and helpful, and the location was over a brief walking distance from the main port. The apartment was extremely clean and comfortable and with a nice private garden with a stunning view of the sea. Irene and Dimitri were the perfect hosts. We were very unlucky with the weather but they were accommodating in offering us rides down to the town and also picking us up after dinner. The views from their place are also amazing! Can’t thank them enough for their hospitality! The property has an amazing view, it looks unbelievable. Irene and Dimitris are very friendly, you can see in their eyes that they are happy to have you as a guest. The room was very clean (daily, after coming back from the beach, we found the room very clean and with new towels). Beautiful place, quiet but close to the town centre. Stunning view. Irene and Dimitri are fantastic, very welcoming and helpful. Thanks to Both for looking after us. Everything was superlative. A wonderful view, a very quiet area, impeccable cleanliness. We met two very special people: Irene and Dimitris (the owners) who were always with us, giving us the best information about Skopelos Island (places to visit, restaurants, etc. ), making us feel even in a paradise. Congratulations to the owners for the honest way of doing business !!! Irene and Dimitri were lovely hosts - picked us up from the port and very helpful. Gave us good advice on which beaches to visit and always keen to know what we had done. Clean bedding every day which was a bonus! Aptly named Irene's paradise has the best view in town! Dimitri and Irene gave fabulous service from collecting us at the Port, driving us to the bike hire and identifying the best beaches for us. The room had option of air-conditioning but we loved the ceiling fan and all windows and doors had insect proof screens. Everything was spotlessly clean and serviced daily. Lock in a great price for Irene' s Paradise – rated 9.8 by recent guests! Surrounded by a garden with bougainvilleas, Irene's Paradise is quietly located within a 5-minute drive of Skopelos Port. It offers air-conditioned studios with furnished balcony overlooking the Aegean Sea and the scenic Skopelos Town. Featuring iron beds, all studios at the Irene's Paradise have a kitchenette with cooking facilities, coffee machine and fridge. Each has a TV. The private bathroom comes with a shower. BBQ facilities are provided in the courtyard. Free Wi-Fi access is provided in public areas of the property. Skopelos Town center with shops and restaurants is 0.9 mi away. Stafylos Beach is 2.5 mi away. Guests are offered free 2-way transfer from the port on request. Free private parking is possible on site. 뀐 Located in the top-rated area in Skopelos Town, this property has an excellent location score of 9.6! When would you like to stay at Irene' s Paradise? Featuring a furnished balcony with views to the Aegean Sea and Skopelos Town, this air-conditioned studio has a kitchenette with cooking facilities, coffee machine and fridge. House Rules Irene' s Paradise takes special requests – add in the next step! Please inform Irene' s Paradise of your expected arrival time in advance. You can use the Special Requests box when booking, or contact the property directly using the contact details in your confirmation. Difficult finding the place. Isolated on a hill. Every needs are available in the room. The owners Irene & Dimitri are very friendly and they welcome the guests with warm hospitality. 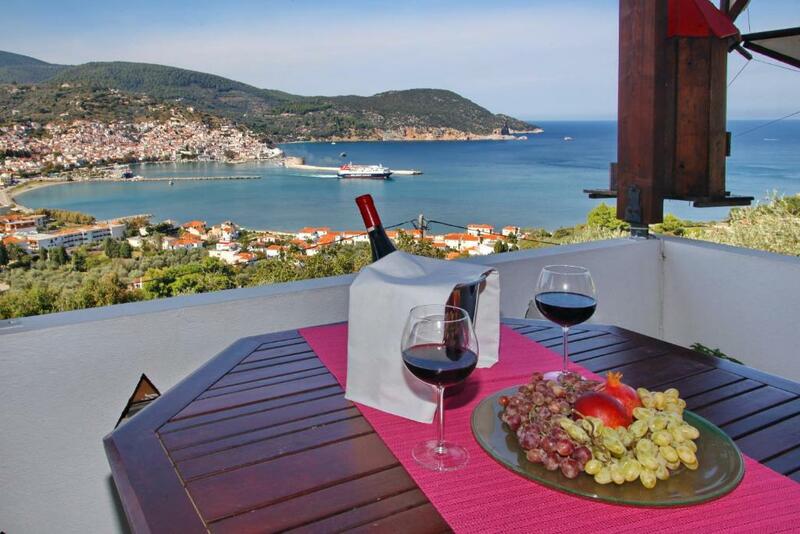 Lovely comfortable apartment with a beautiful garden and views over Skopelos. Dimitrius and Irene were extremely friendly and helpful. We loved our stay here. The place is great and Irene and Dimitris are amazing hosts. Upon arriving we had a huge problem with the car and Irene and Dimitris helped us to deal with the issue, Dimitris even drove us to the beach on the next day and later picked us up! So if you want to have amazing view, great private balcony and incredible people as hosts I recommend you to stay there! The hotel is a bit out of the way. It was about a 15 minute walk up hill and 10 minute walk down a hill. The hosts were always more then willing to bring us down into the town. It really is an amazing place with some of the best views the town has to offer.